Maureen and Chris Welcker with children (from left) James, Lily, and Oliver, during the Idaho family’s visit to Plymouth. The American school curriculum is full of thrilling subjects: volcanoes, salamanders, Civil War battles. But most students learn about these things while stuck in a classroom. Not so the Welcker kids, who this year have taken their education on the road. At Yosemite National Park, James, 9, and in the fourth grade, learned that sequoias are the world’s largest tree and that fire helps them disperse their seeds. At Point Reyes National Seashore, third-grader Oliver, 8, was especially excited to see with his own eyes what the San Andreas Fault did to the land. After visits to Civil War battlefield sites like Antietam and Gettysburg, even Lily, 4, the Welcker’s preschooler, could tell a Union uniform from a Confederate one. The Welcker family, from Boise, Idaho, has taken President Obama’s “Every Kid in a Park” initiative, a program to entice fourth-graders and their families into the US National Parks for free, beyond any bureaucrat’s wildest dreams. This fall, they pulled their kids out of school. They loaded up their Toyota Sienna minivan with camping gear, snorkels and wet suits, snowsuits, even Halloween costumes. And then, with a plan to spend September through June visiting as many national parks as possible, they hit the highway. By the time they rolled into Boston on Nov. 16, they already had some 40 parks under their belts. 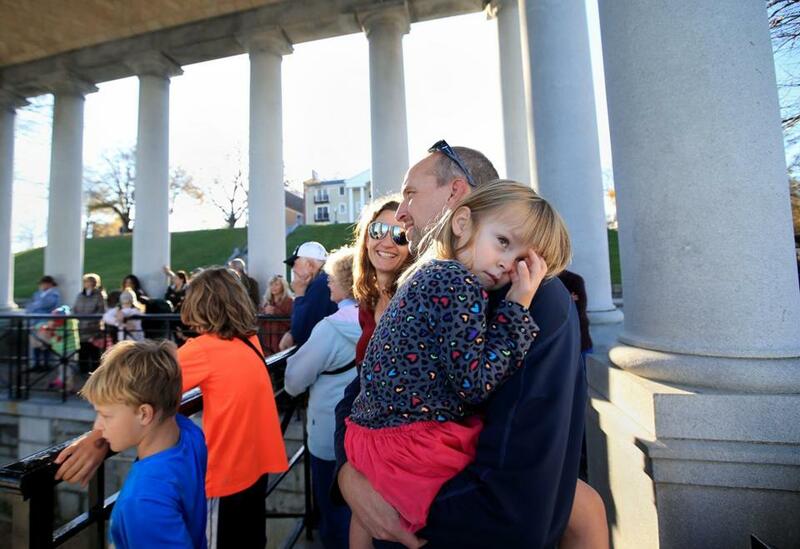 Lily Welcker rested in the arms of her father, Chris, while visiting Plymouth Rock in Plymouth. Chris and Maureen Welcker, who met as Peace Corps volunteers in Ghana, aren’t diehard homeschoolers, raging patriots, or hippies. They just genuinely believe in the educational buzzword that is “experiential learning,” and thought they’d spend a year using the public resources of the country to teach their kids about biology, American history, geology, writing, engineering, and other subjects first-hand. Their classroom and curriculum involve dozens of the country’s 59 “big” national parks and 350 other protected properties in the National Park System: national historic sites, historical parks, battlefields, memorials and monuments, recreation areas, and seashores. In Boston, the family began at Boston National Historical Park, whose sites, including Faneuil Hall, Bunker Hill Monument, and the Charlestown Navy Yard, highlight Boston’s role in the American Revolution. “Mom, where is Griffin’s Wharf?” asked James, gawking at a giant 3-D map of the Colonial-era Boston waterfront inside Boston’s Old South Meeting House, a key stop on the Freedom Trail. “What happened at Griffin’s Wharf?” Maureen quizzed him, as Lily clung to her mother and Oliver explored other displays. James explained that Griffin’s Wharf was the probable location of the Boston Tea Party. Mother and son located the wharf on the map, and a discussion ensued about the Colonists and their radical protest. 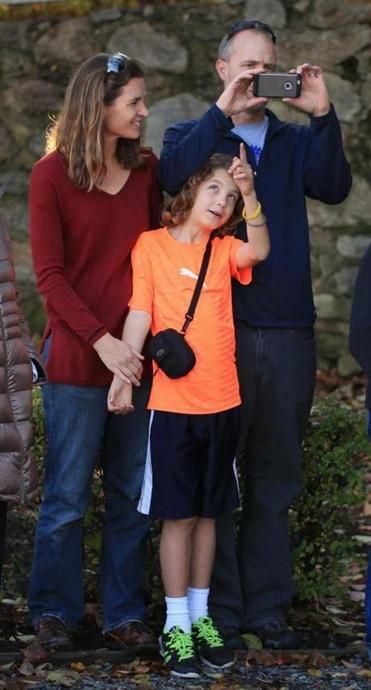 Maureen and Chris Welcker, with son James, during a visit to Plymouth. The parents worried initially that a year off might not fly with officials at the boys’ public schools. But they say that both teachers and the principal agreed that the kids would learn more on the road than in the classroom. 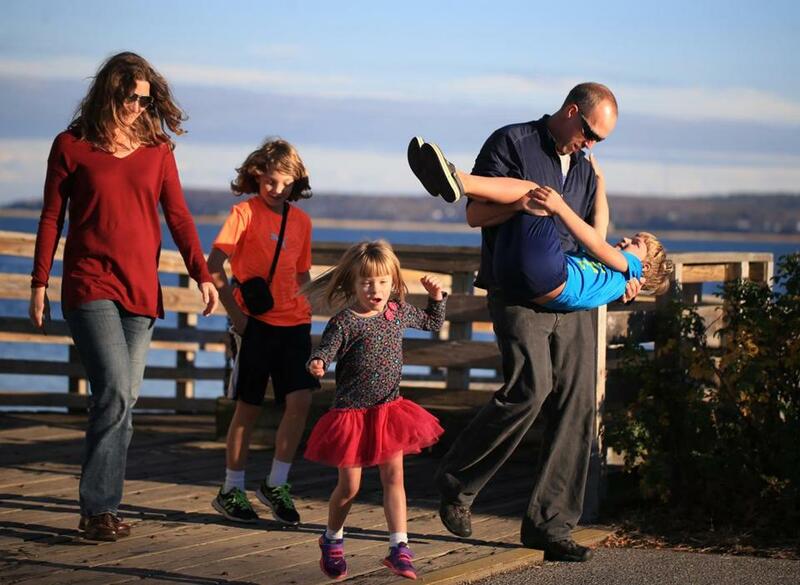 Chris can’t take off big swaths of time from work, so he’s been flying in to meet his wife and kids a couple of times each month. (Maureen, a public health professional, is currently raising the kids full time.) Chris joined them for Plymouth’s Thanksgiving festivities, where they marched in the parade dressed as pilgrims. The kids wondered what it must have been like for their dad’s ancestor Samuel Fuller to step off the Mayflower. “My dad’s side, we’re also pilgrims,” said James, the trip photojournalist, on an academic pizza break in Quincy Market. “My favorite park was San Juan Island, because I got to see orcas,” Lily said, munching on a crust. Maureen’s biggest epiphany has been “to recognize the kids’ interests aren’t always what might be the main focus of the park,” she said. For example, the Great Smoky Mountains is better known for its black bears and ancient peaks. But Oliver and Lily focused like laser beams on salaman-ders. “It’s the salamander capital of the whole world there,” Oliver said. Armed with a line of inquiry — Where can you find and how can you catch salamanders? — he enlisted the help of rangers, and soon he and sister were ankle-deep in creeks finding them. 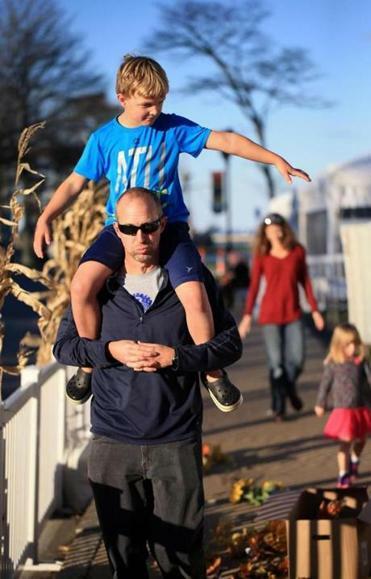 Chris Welcker gave his son Oliver a ride on his shoulders during the family’s visit to Plymouth. At all parks, the children pick up “Junior Ranger” activity books to help guide their visit. To stay connected with their classmates back in Boise, the kids send postcards from each park, and the students follow their family’s blog. “Even though most kids think it’s a big old fun trip, ” said James, “we have to do work in the car.” To keep up with basic subjects like math, the children complete workbooks. The family is not the only one using the parks for homeschooling, according to Kathy Kupper,a National Park Service spokesperson; it’s “rare” but “not unprecedented,” she said. Another family is blogging about their experiences at ayearintheparks.org. “Where better to learn than to walk in the footsteps of the Founding Fathers, or look at the geology of the Grand Canyon?” Kupper asked. After visits to Cape Cod National Seashore, Plimoth Plantation, and Acadia, the Welckers will migrate south for the winter, via Historic Jamestowne, on their route to Florida for Christmas. Then they’re off to more big Western parks until Martin Luther King Jr. Day, when they’ll hunker down at home in Boise for a two-month break before hitting the road again in early spring. Along the way, the Welcker kids are drawing on a far wider range of learning materials than they’d find in an elementary school classroom — sometimes even including the classroom material of the past. Oliver paused, and looked thoughtful for a moment. Some connection, it seemed, was stirring inside him. Ethan Gilsdorf can be reached at www.ethangilsdorf.com. Follow him on Twitter @ethanfreak.